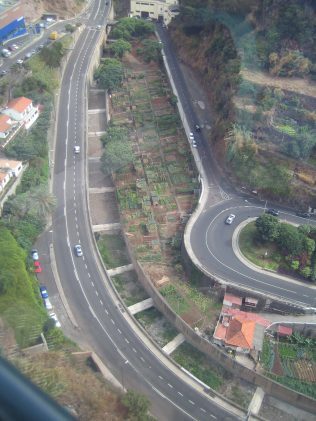 This is a photo taken from the cable-car that goes from sea level in Funchal to Monte 560 metres up the mountains on the lovely island of Madeira. I was very surprised to see squashed into a ravine between two roads (one being the main road into Funchal) a very smart looking allotment site! It was only later on reflection that I realised that this site was probably ravaged by the floods in February that ripped through Funchal – To the left of the site you can see a ‘levada’ that carries one of the many stream/rivers down through the town to the sea. It was these that burst their banks during the floods and caused so much destruction. It is good to see only 8 months later that projects like this are showing the recovery of the area. You can’t see in the photo but very smart (and matching) new sheds are on every plot. I would love a chance to do a couple of seasons growing in Madiera, you can literally grow veg all the year round… an allotmentistas dream!